“Over there in that house,” they replied. “What are you doing here?” Halcomb asked, surprised to see this outsider on his doorstep. “Well, I’m looking for music,” Cohen said. 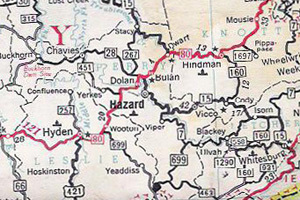 On a muggy Sunday afternoon in June of 1959, John Cohen wandered the winding mountain roads of eastern Kentucky searching for old-time musicians. Neon, Bulan, Vicco, Viper, Daisy, Defiance — tiny coal and timber towns with sonorous names popped up around each bend before giving way to the Cumberland Mountains. Cohen had come to Kentucky from New York City to find songs about “hard times” that would fill out the repertoire of his old-time music group, the New Lost City Ramblers. In 1959 John Cohen traveled to East Kentucky looking for what he calls “old music”. Cohen asked for names at local gas stations but soon ran out of leads, and drove off the highway onto the next dirt road. Here he stumbled across Roscoe Holcomb playing the banjo and singing on his front porch in a way says Cohen, “that made the hairs on my neck stand up on end”. And so by pure chance began the life-long friendship that is the background for The High and Lonesome Sound. Cohen visited Holcomb frequently over the next three decades, and made many photographs, films and records of his music. In time Holcomb, a poor coal miner by trade, became a regular feature on the American concert and festival circuits. The “strange beauty and discomfort” of his music – a mixture of blues, ballads and Baptist hymns, and unique through his high strained voice – was exposed to a larger audience. Nevertheless Holcomb died alone in a nursing home in 1981. The High and Lonesome Sound combines Cohen’s vintage photos, film and musical recordings as well as an anecdotal text into a multimedia tribute to this underappreciated legend of American music whose every performance was in Cohen’s words “not just a rendition of music, but a test of something to be overcome”. After a 1961 series of concerts featuring Roscoe Holcomb, Clarence Ashley and Doc Watson, Alan Lomax invited the artists and a who’s who of the folk revival back to his West 3rd Avenue apartment for an impromptu song swap. Filming was arranged on the fly and a raw, many-layered evocation of the art and attitude of the period emerges from the footage, with some of the biggest names of the era, old timers and revivalists alike. The unalloyed pure spirit of old time music never had a stauncher exponent than Roscoe Holcomb. His stewardship of the True Faith came naturally (though not effortlessly); he didn’t seek his missionary role but nonetheless embodied it like no other. Given his deep and implacable uniqueness, it comes as little surprise that Eric Clapton once referred to Holcomb as his favorite singer, or that Bob Dylan lauded similar praise on Holcomb’s album, “The High Lonesome Sound” (Folkways FA2368). There was something almost super-naturally intense about Holcomb’s engagement with his ma- terial: not only did he move others to tears but on occasion was himself so affected by a performance (like that of Little Bessie on the aforementioned album) that he would enter a days-long seclusion from music-making. It wasn’t an activity Holcomb took lightly; given his shamanic wrestling with his music’s essence, how could he? ‘Soul singer’ is a sobriquet that fits Holcomb, for he sang from his tradition’s core. John Cohen’s new film, “Roscoe Holcomb: From Daisy, Kentucky” is out. It has been released by Shanachie Video and is available for purchase by CLICKING HERE. From liner notes to “The High Lonesome Sound,” notes by John Cohen.